For a long time I’ve loved cardigans. They’re great to wear because of their ease of getting on and off. I’m sure there’s other reasons I love cardigans but I can’t think of any right now. I used to be known as Jen Cardigan ……. because that was all I wore. This name even got lengthened to Jen Off The Shoulder Cardigan …… (the dots are my last name). 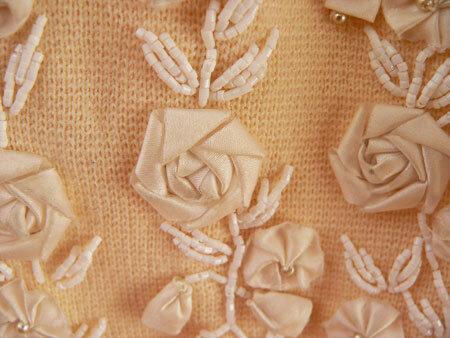 I bought this cardigan because who couldn’t resist this type of detail? I used to have a similar cardigan but it wore out and had to be thrown out. I spent more on this cardigan than I spend on most of my clothes because I’d received a couple of vouchers for a second-hand clothing shop and bought some great stuff there, including this. In fact, one day, I thought I’d go to this shop to use my voucher but spent at least one hour looking for it and still couldn’t find it. I rang the shop and as they don’t keep records of these things they couldn’t replace it but suggested I look in my handbag. I’d already looked in all my handbags to no avail, but I had another look – a proper one this time – and it turned up. 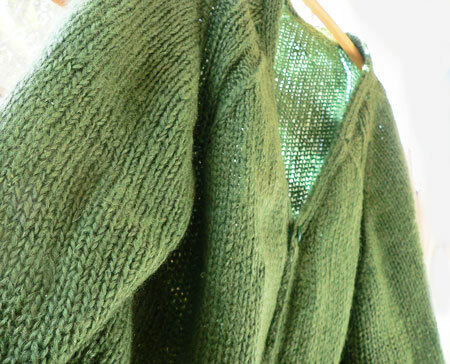 When I used to knit more prolifically than I do now I knitted some cardigans. 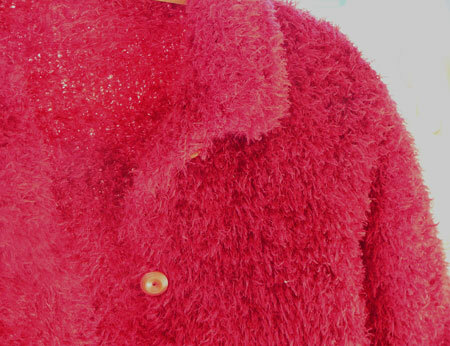 I bought this mohair wool when in Melbourne in around 1986 from a little shop in the city somewhere. I originally started knitting a jumper but realised that I wouldn’t have enough wool so unpicked what I’d done and found a cardigan pattern and this was the result. This was the cardigan responsible for the Off The Shoulder name mentioned above. I wear it a lot in winter and JJ was born in winter so I wore it a lot for the first few months of his life. He was one of those babies who threw up a lot after feeds and despite wearing towels over my shoulders, his vomit invariably ended up on my clothes. I distinctly remember handwashing all my winter woolies that year. This is acrylic I bought when still going out with my ex-boyfriend about ten years ago. It took nearly that long to make but I eventually finished it a few years ago. It is really warm. I wore it the other night and had no need to put a coat over the top to keep me warm because this was warm enough. Now I feel like getting out the knitting needles and knitting another cardigan. Perhaps I will! Oh, you’re a cardi-girl! Beautiful. One great thing about being a “creator” of clothing is that you do always have a story behind the garment. I haven’t got the patience, nor the eyesight, to knit them myself lol. Jeanie, yes children do take up a bit of time don’t they. This is probably why if I do knit these days it’s only scarves or beanies. Jayne, sadly my eyesight’s failing me too. The only time I can really knit is at night and unless I get a full-on spotlight happening the knitting won’t happen. I’d definitely stay away from black wool too. Those are really beautiful….it is strange to me that it is fall there….when we are so hot here! Stacie, the heatwave we had a few months ago is a distant memory. Now I look forward to lighting the fire and watching television all snuggled up in my pajamas and dressing gown. At the moment I love the oversized ‘grandpa cardi, with it’s patchd elbows and cable knit goodness but will go any cardi that wraps around you, is not too snug and can fit me and a couple of toddlers inside, when the need arises. Cardis are also good when you are carrying said toddlers in a carrier because you can put them over the top of the whole mess and cover up all the wobbly bits that poke out from the bands and belts of the carrier. Cardi’s bringing back memories. Maybe that’s part of it for me too. I definitely had home knitted things though. Tiff – you’ve got varied uses for your cardigan haven’t you? It sounds like a cross between a garment and a blanket. I love a cardi and I have picked up a couple of great ones recently second hand. Oh I love your cardies….particularly the green one! I am a cardy girl, too! They are great for our weather where it is warm in the day time and cooler in mornings and evenings. They can make summer tshirts wearable all year around cause you just pop a cardy over the top! And best of all….they are slimming….layers and all that stuff! I absolutely love that apricot colored carigan. It is so delicate and beautiful. Did you really buy it at a second hand shop? Daisy, yes I really did buy it at a second hand shop. Oh, and it’s not apricot in colour. It’s more of a cream colour. 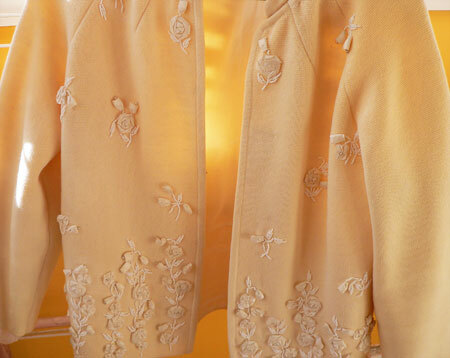 It’s due to the colour of the walls and the sunlight that it looks more apricot.